It is natural to regard magnetic resonance imaging-and-spectroscopy devices as communication channels, in which a key question is, how many bits-per-second can the sample send to the receiver? 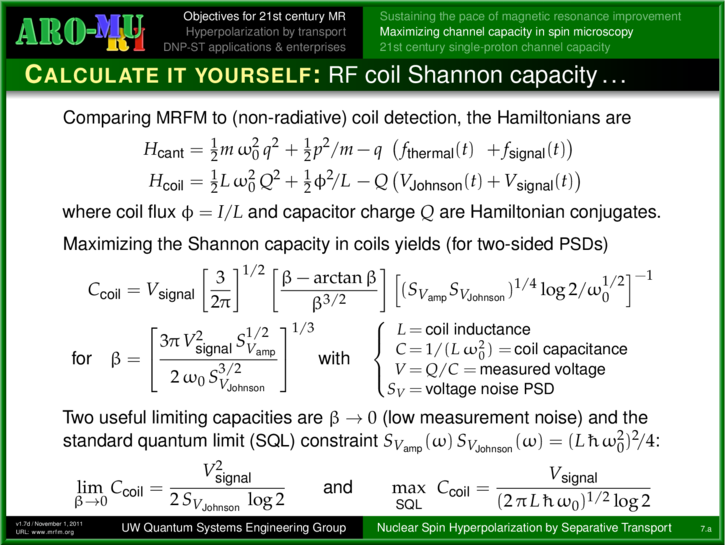 The standard quantum limits to noise in the receiver are well understood, and Shannon's capacity theory tells how to optimally modulate the transmitter spin. The main problems are practical: (1) fabricating low-noise receivers (both macroscale and microscale), and (2) hyperpolarizing the transmitting spins in the sample (including living people). @JohnSidles: As it happens I have a paper with some others on exactly the question of the extraction of information from a spectrometer beyond the standard quantum limit (arXiv:1007.2491). @JohnSidles: Standard quantum limit often refers to separable states only, whereas the Heisenberg limit is in metrology the Heisenberg limit is the "performance that can't be bettered supposing that standard QM is true".